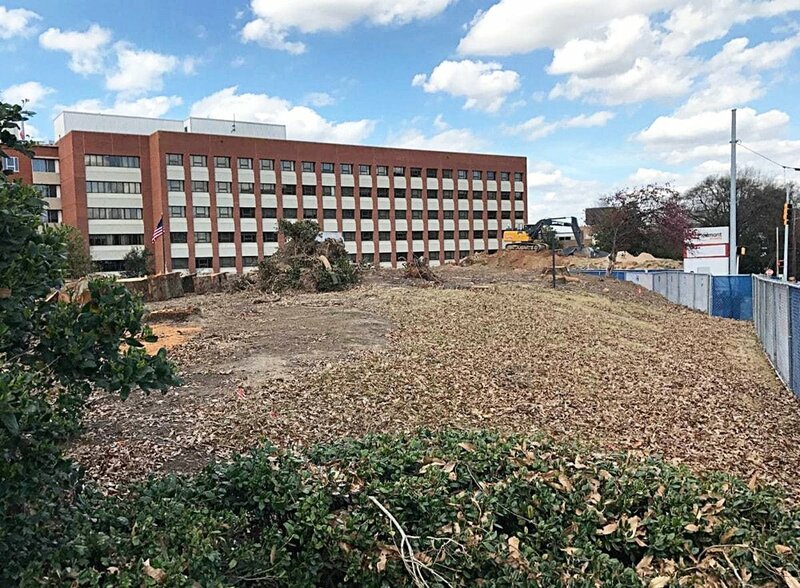 Piedmont Hospital Root-to-Fruit — Eutree Inc.
Piedmont Hospital embarked on an expansion to better serve metro Atlanta's growing population and healthcare needs of the community. The expansion began with the establishment of the Marcus Heart and Vascular Center through the philanthropy of The March Foundation. This state-of-the-art facility speaks to Piedmont’s reputation as a premier destination center for cardiovascular care, and will enable the critical expansion of other key healthcare services. 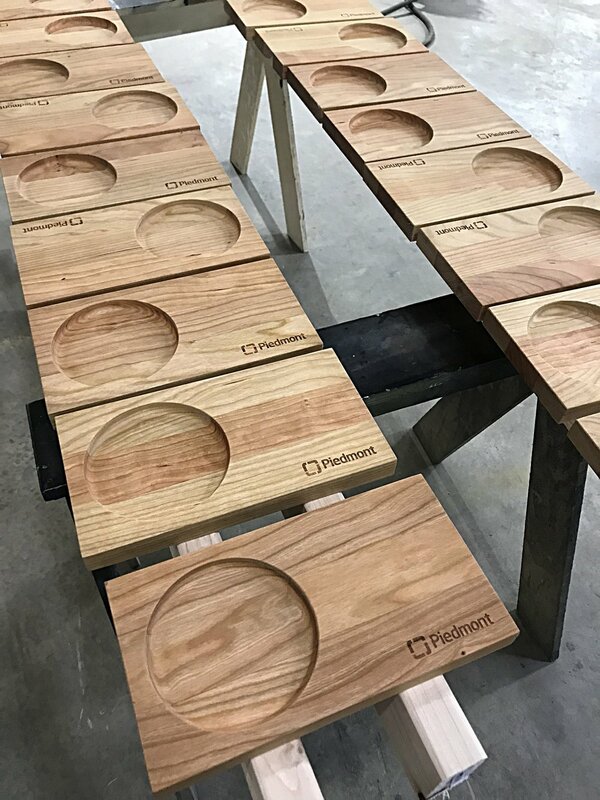 Piedmont engaged Atlanta-based furniture maker Skylar Morgan Furniture + Design to repurpose the lumber from the trees on the project site into specialty furniture items for use in the new facility. Eutree was brought in to help to salvage and mill the the timber from the logs into slabs and dimensional lumber. A local grading company and tree service was brought in to carefully remove the trees and transport to Eutree's manufacturing facility. Special care was taken to minimize impact to the tree canopy and surrounding environment. Piedmont plans to plant new trees once the build is complete. Because optimizing the usefulness and economy of materials is a primary component of sustainable design, each tree is selected for a specific purpose. This selection criteria is a core value of of the "Root-to-Fruit" process that allows for intentional design of a product that goes into the building. Logs arrive to Eutree’s lumberyard to be milled into slabs and dimensional lumber. Piedmont's team was engaged throughout the process, and participated in observing the milling process onsite at Eutree's lumberyard. Eutree's chief sawyer oversees the milling of each log into slabs on the Wood-Mizer 1000 sawmill. Once all of the logs are cut into slabs on the mill, they're stacked and stickered to air dry in the lumberyard for several months. In the meantime, logs milled into cants are processed into boards for dimensional lumber on the re-saw. After the air-drying process, the slab stack is lifted onto a Bobcat to transport to the kilns for heat drying. The slab stacks are loaded onto the kiln cart. A forklift is used to push the kiln cart with the slabs back into the kilns. The slabs are heat dried in the kiln for 30 days. After the drying process, the kilns are reopened and the slabs are surfaced, and then transported to Skylar Morgan Furniture + Design to be made into custom furniture items for the hospital. Stay tuned for more finished furniture items from Skylar Morgan Furniture + Design coming soon!